Located three miles north of Two Harbors, the Stewart River takes its name from early pioneer John Stewart, who settled in the area in 1865 looking for copper deposits to mine. He never found any. 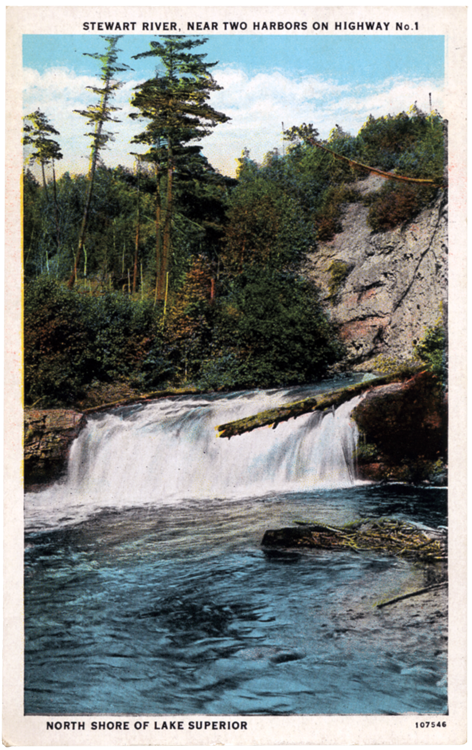 Logging occurred along the Stewart in the nineteenth century, but the river was so rocky and narrow it often jammed with logs. Today the mouth of the Stewart is a popular place to catch lake trout or to stop for a piece of pie at perhaps the North Shore’s most famous eatery, Betty’s Pies. Betty and Lloyd Lessard opened their shop in 1956; the original building—the former Andy’s Fish Shack—was demolished in 1984, two years after Betty sold the enterprise.